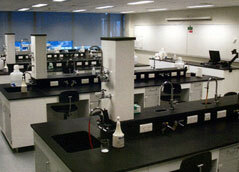 Lab is well equipped with following cut section models and charts. Boilers - Cochran, Lancashire, Babcock & Wilcox, locomotive. Boiler Mountings-lever safety valve, Spring Loaded & Dead weight Safety Valve, Combine High steam & Low Safety Valve, Stop Valve, Feed Check Valve, Fusible plug. Boiler Accessories-Steam Injector, Economizers, Super heater. Types of Coupling, Clutches. Reciprocating and Centrifugal pump. Engines -2 & 4 stroke Petrol/Diesel, Turbines- Gas and Steam. 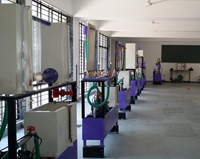 This lab enables students to understand basic concept of fluid mechanics, statics, dynamics and various approaches to fluid mechanics, fundamentals of flow through pipes and Correlate fundamentals of fluid mechanics with various mechanical systems. 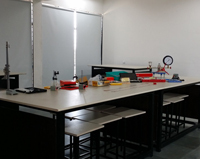 The lab is equipped with different set-ups such as Bernoulli�s theorem, orifice & mouthpiece, notch and weirs apparatus, venturimeter, rotameter & orificemeter apparatus, energy losses in pipe, pitot tube, free & forced vortices, metacentric height of ship model. This lab provides a means of assessing the suitability of measuring instruments, their calibration, and the quality control of manufactured products. 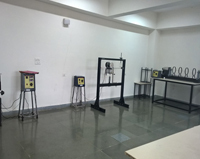 This lab includes measuring Instruments-Micrometres, Verinier, Dial Gauge, Height Gauge, Telescopic Gauge, Bevel Protector, Plug Gauges, Gear Tooth Caliper, Sine Bar, Thread Plug Gauge, Radius Gauge, Screw Pitch Gauge and Slip Gauges, Dead Weight Tester, Thermocouple with Digital Multimeter, Surface Roughness Tester with computer interface. This lab used to study the structure-properties relationships of various materials for their proper applications. Especially study of different types of ferrous and non-ferrous metals and alloys, in terms of their composition, structure, properties and applications, to understand the concept of hardenability and its relevance to heat treatment process. 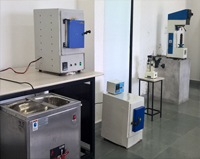 The lab is well-equipped with Metallurgical microscope with image analyser software, Double disc polishing machine, Belt grinder, Jomny end quench hardenability test apparatus, Vickers hardness testers. 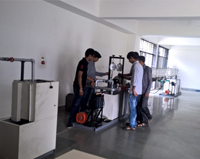 The lab is well-equipped and enables students to learn the benefits and limitations of fluid power compared with other power transmission technologies, to understand the operation and use of different hydraulic machines like hydraulic crane, fluid coupling and fluid torque convertor etc. 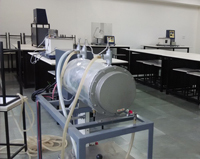 The lab is used to predict the performance of fluid power components like turbines, pumps. The lab includes the experimental set-up like-Impact of Jet on Vanes, Pelton Wheel & Francis Turbine Test Rig, Centrifugal , Reciprocating & Gear Pump Test Rig with swinging field dynamometer, Two-Stage Air Compressor Test Rig and Tilting Flume Apparatus. The objective of lab is to understand and handle design problems in a systematic manner and to gain practical experience in handling 2D drafting and 3D modelling and Analysis software systems. It is to be used to apply CAD in real life applications. Lab is well equipped with 24 Dell Vostro Desktop Computers (Intel Core i7 processor) with 1 server. The lab has licensed Operating System and solidworks software. 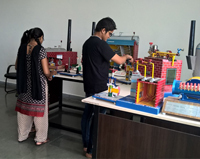 This lab helps the students to understand the renewable and non-renewable energy sources. 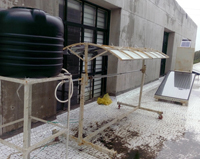 The laboratory is equipped with a experimental setups like - Solar Still Desalination System, Parabolic Solar Line Focusing Test, Wind Turbine, Solar Cabinet Dryer, Solar Domestic Box Cooker.